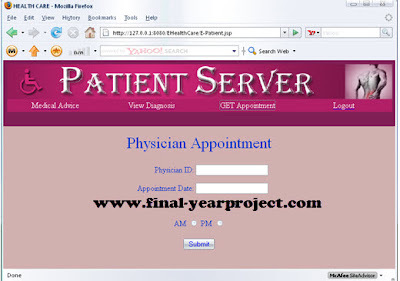 This is a computer science final year Java project report on "distributed e-healthcare system" that uses the Service- Oriented Architecture as a means of designing, implementing, and managing healthcare services. Effective and timely communication between patients, physicians, nurses, pharmacists, and other healthcare professionals is vital to good healthcare which is the primary goal of this project. This system aims to reduce human errors by exploiting electronic communication and record keeping, and by providing user-friendly input and output capabilities. You can also Subscribe to FINAL YEAR PROJECT'S by Email for more such projects and seminar. The prototype of distributed e-healthcare system uses SOA to enforce basic software architecture principles and provide interoperability between different computing platforms and applications that communicate with each other. Software requirement of this project are JDK 1.5, Web Browser – Internet Explorer, Apache Tomcat 5.5 Server, Derby Database, JSP and Servlets, Axis Web Service, Atom/RSS, J2ME & XML. This report also include sample programing code and screenshots. Use this project for your reference and study work only.